“Who shall find a valiant woman? Far and from the uttermost coasts is the price of her. The first born child of William Cant and Anne Wessler was Lillian Gladys. Her birth and death certificates give her name as Lillian Gladys, but she called herself Gladys and “came to be called” Gladys. She was born 9 December 1889 at Lithgow Street, Goulburn, her parents having been married but two days earlier. Her first four or five years were spent in Goulburn, her younger brother Francis John Henry born 18 July 1892 and younger sister Stella being born in Mundy Street, Goulburn in 1893. There must have been a move to Morundah near Narrandera, for that is where Anne Cant died in October 1895, leaving a husband of twenty-eight with three children of six, three and two years of age. It is easy to understand why William Cant remarried the following June: a wife to his bed and a mother to his children, he being on the move from place to place with his railway work. It was at Jerilderie that Francis made his first Communion in 1905 and was confirmed in 1906, aged fourteen. At this time Gladys was almost seventeen and close to leaving home. Gladys seems never to have got over the early death of her mother: she spoke of her with affection and sadness, though she could have remembered little of her, being only six when her mother died. Her memories were no doubt heightened by her lack of fondness for her step-mother. It was only a few years before her own death that she told us her mother had been adopted. My mother and I were simply stunned, because this news had been untold for so long – like the existence of her youngest step-sister, Molly. At the same time Gladys gave me a photo of her mother, a fine looking woman, if a little severe, maybe even regal, with drawn-back hair and penetrating eyes. For me, the mystery of her background is strengthened by, I believe, the distinctly aboriginal cast of the face. I still recall Doug’s reaction to seeing the photograph (as if for the first time) the day of Gladys’s funeral: “Ah,” he said, “a touch of the tar-brush there!” And I still deeply regret that I never asked my grandmother for any details of her mother’s background – which I have never been able to discover. We are working on DNA currently. In some ways Gladys became mother to the family, more so in later days when so many people looked to her for support and attention. Perhaps she was compensating for the difficult times she had with her step-mother. What those difficult times consisted in is not clear, but Gladys left a strong impression that she did not get on well with Sarah Grieves, who, she thought, treated her with less justice than a step-daughter deserved. The story of the late music examination fee symbolises all that was ill in those far-off days of Gladys’s youth. 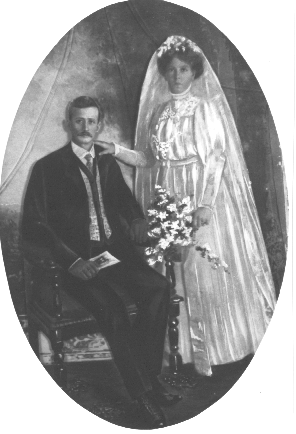 William Cant met Sarah Grieves in Jerilderie, but their wedding took place in Goulburn. The children may well have been at Goulburn, perhaps with William’s parents. 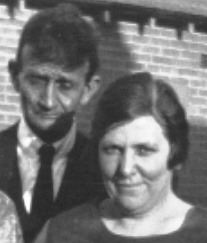 The next we know of the family is that they are in Cootamundra where William junior, the first child of William Cant and Sarah Grieves, was born in 1897. There seems to have been a more permanent move back to Jerilderie for some years: next son Clarence was born there in 1901 and the youngest child, Mildred (Molly), in 1904. Nevertheless Gladys must have had a sound education: she was a beautiful writer and had a head full of all those sorts of things that primary education used to insist on. Besides, she was obviously well enough qualified to become a tutor to several private families. It seems that she taught the children of several families for some months when application was made for her to become the teacher of a subsidised school in South Yalgogrin. “REGULATIONS in connection with the Granting of Educational subsidies in Thinly-populated Localities. (a) That subsidy shall be paid only on account of children five years of age and over. (b) That the number of children in the locality is not sufficient to warrant the establishment of a Public, Provisional, Half-time, or House-to-house School; that no existing school is within reasonable walking distance; and that the conveyance of the children to an existing school, either with or without aid from the Department, is found to be impracticable. (d) That the teacher shall not be required to render service of a non-educational character, except such as may be undertaken for a separate remuneration. (e) That suitable accommodation is available for the teacher. (f) That five hours of each school day, in accordance with a fixed timetable, be regularly devoted to the instruction of the children, in accordance with the Syllabus of Instruction. (g) That the school be subject to inspection by an officer appointed by the Minister. (h) That records be kept and returns furnished as required by the Department. 56. Such fees as may be mutually agreed upon by the families concerned and the teacher, shall be paid to the teacher as a supplement to the subsidy granted by the Minister. 57. Necessary supplies of reading books will be granted. 58. The regular school vacations and holidays will apply to Subsidised Schools. If, however, the prescribed instruction be not given on any school day, and such omission has not been sanctioned by the Local Inspector of Schools, deductions will be made from the amount payable as subsidy to the teacher. 59. The subsidy may be withdrawn if any of the foregoing provisions be not observed, or if the character of the instruction be considered by the Minister to be unsatisfactory. From an extant account, she received for the period of 23 June to 31 July 1908, for teaching an average of ten pupils per day, the splendid sum of Five Pounds, four shillings. She was to teach there for eighteen months, till December 1909. Her elegant Composition Book is inscribed with several places and dates: “Rosemead, Easter 1908”, and “Melrose Valley via Condobolin [written back to front – Gladys was quite adept at this kind of mirror writing, as some of her extant postcards attest] 15 April 1909”. Her Composition Book probably served as a lesson notes to be copied onto the blackboard or dictated. The writing of the eighteen year old girl is firm, mature, impressive – so indicative of her character and of a style that did not change even till the last time she signed her name. “Salt”, she writes, “is a mineral. There are three kinds of salt …” “Water is a liquid because it takes the shape of the vessel that holds it …”. “Clouds: It is pleasant to watch the clouds and observe their different shapes and colours”. Flax, sugar, air, are all written up for the children to learn. There are poems and proverbs too: “A bad workman quarrels with his tools”, and “To labour is to pray”. These simple lessons were taken to heart for she was a woman who practised what she preached. There are “CXIV” (114) pages of notes and poems, the last one being dated 17 December 1909. She was married 16 February 1910, and the next few pages of the book are used – undoubtedly in the early years of her marriage – to write recipes for soap, yeast, ginger cordial, hop beer, linoleum cream and furniture polish. This is indeed the “valiant woman” of The Book of Proverbs. In 1908 the Cant family was living at Yass Junction and remained there till 1914 when they moved to Granville. Gladys had left home to make her own life and marriage, but in some ways she never left because she always kept contact through letters and visits and retelling of stories: the Cant family was our family in a very real way that Butler family never were. Everybody returned. Doug even bicycled from Darlinghurst to Granville to visit the family there. Many of the postcards are still in existence: Stella left behind a whole album full which I found at her daughter Jacqueline’s Glenview Street house in Paddington. They are an invaluable insight into these few years of Gladys’s life. There were nineteen written by Gladys between 23 July 1908 and 18 March 1920, fifteen to Stella, the others to Will, “Mater” (ie, the stepmother Sarah Grieves) and her father. They reveal something of the woman behind them, but also indicate how much she hid: talk about the weather and things she did, but most of all requests for letters in return – she was quite bossy in her requests, yearning, it seems, for family contact. The first four postcards from Gladys to Stella are addressed “c/- E. Pope Esquire” to Stella c/- Railway Station Yass Junction”: Gladys was living with the Pope family at South Yalgogrin. “It is raining”, she writes, 23 July 1908, “but the grass is only fair”. She did not get “either” of Stella’s postcards till the previous Monday; and “don’t forget to answer by return of post. Love to all at home”. The postcard features a pretty ribbon arrangement of the name Kitty – Kathleen was Stella’s first name. 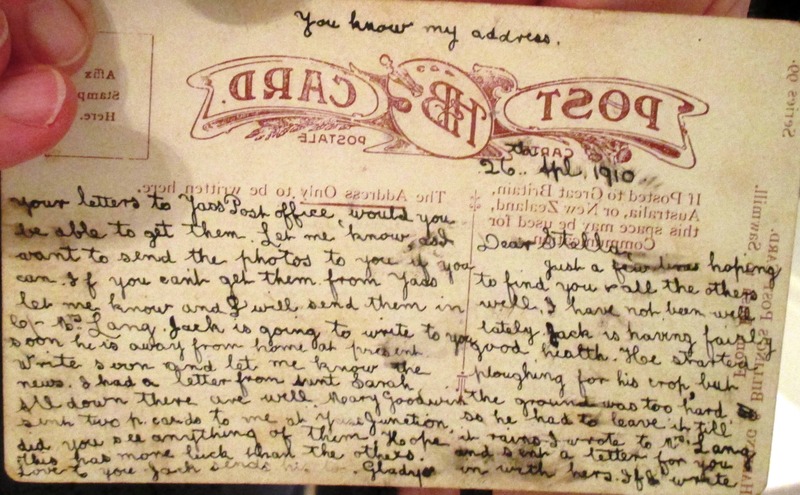 “Dear Mater” (Sarah) is the recipient of the second card, 20 October 1908. It is “just a line or two in haste hoping to find you all well as this leaves me at present”. No time to write, shall do so, all is well, enjoy your holidays. “I remain yours in haste, Gladys”, and a coloured view of the Ocean Beach, Manly. Keeping in touch, dutifully! “Mater” is a very formal address to her step-mother (and a word that I would not have expected Gladys to use, it being so “English”) but it may have been a family usage: her aunt, Mary Hunter, her father’s sister, uses it in her correspondence, and after all the Cants were of English background. Stella’s card arrives and is welcome, 3 November 1908, but “I notice you don’t forget to keep me waiting long enough for an answer. Mind I want an answer in a week”. Seven weeks to Xmas, lovely weather, “It is that hot it will nearly bake you”. “Would like to be back at Yass. I suppose it is cool there.” The postcard shows the façade of Sydney University, and a note is added: “… this is the best I have so you will have to do with it.” A touch curt perhaps. The twenty year old girl is lonely and as anxious for news as she is full of it: Fred and Mona, her Aunt Mary’s children, have the fever badly, she writes 23 February 1909. She has had a letter from Aunt Mary (Mrs John Hunter, William Cant’s younger sister). She has not had one from Stella and “though you say you sent one I can safely say that I did not receive it. I was vexed to think you did not have the good manners to answer my p. card, but if you sent one, it must have gone astray. I suppose I will forgive you this time”. She won’t be home for Easter. There has been lovely rain. This postcard could not have had another word written on it; it is packed with news: “I had a letter from (Aggie) the other week. She is in (Coota). I see things are altering about (her) John again.” (The bracketed words are obscured.) She concludes: “Son Hall sent me his photo, so did Jack”. 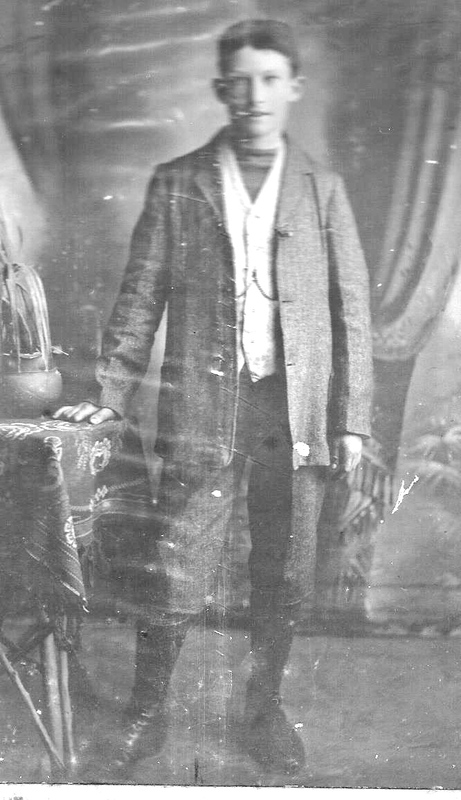 Son Hall was a cousin and the son of Aunt Sarah Cant who married James Hall. Love is in the air: Jack was undoubtedly the man she was to marry twelve months later, John James Whittaker; and at this time Stella was probably seeing Charles Murray, for their son Jack Cant was to be born the next December. Stella and Charles Murray did not marry. The card features a picture of Rita Martin, an Edwardian beauty holding a rose in her mouth. The boys were Frank – I presume – and William and Clarence. As for Stella’s postcard, who knows. However, the card Gladys sent to Stella was surprising: a black and white photo of a Miss Kitty Mason, a prominent Edwardian Actress, very beautiful, with shoulders bare down to the breasts! I wonder whether it was a covert allusion to Stella (Kathleen – Kitty). The stamp cost a penny – NSW Postage. 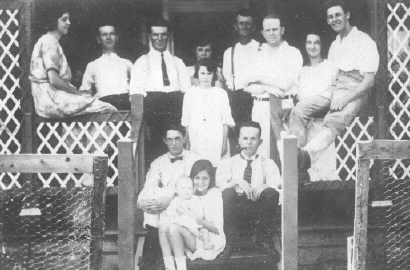 The wider family is obviously important to her: Maud and Ciss, Uncle Martin’s daughters; Aunt Mary’s Fred and Mona; others unknown. In June 1909 Gladys is writing c/- Mrs. J. Whittaker, Melrose Valley via Condobolin. This lady, Elizabeth Whittaker (later Granny Smith, as my mother called her. She married Billy Smith after her husband John’s death), is soon to become her mother-in-law. She is enjoying “the best of health”, she writes 22 June. “This is one of the Condobolin photos. What do you think of it? The winter so far has been beautifully mild. Has the excitement about the Federal City died out in Yass? I am glad the Mater has taken a holiday. Which of the Cants do you have visiting you? I have no news to tell you as you are not interested in anyone or anything about here.” A little brusque – what has happened? Even her new-found love – for by this stage she must be getting serious about John James – does not ease the trouble. She concludes: “Give my love to all”, adds “yourself included” and finished coolly “Yrs. respect. Gladys”. The card features the Court House, Condobolin. Her card of 28 September 1909 seems a mixture of excitement at her own situation and chagrin at Stella’s taciturnity. Stella’s card was very welcome and very pretty and “you will think I am a very long time answering it. I have not had much time.” Mrs Whittaker had been away in Parkes for eleven weeks with a bad leg. Gladys was in town at show time, and had been to the Vermont Hill Hospital picnic. There was a ball that night, “but I did not stay for it. Dancing is not in my line these days.” Has Stella been to any amusements lately: “When you write to me you tell me nothing I ask you. Why don’t you answer any question I ask you? One would think I did not know anyone about there. This is all the news this time, so don’t forget to write soon and let me know all. 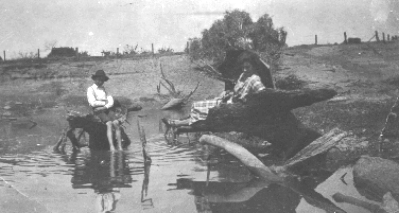 I remain Yours truly Gladys.” The card features the Goolong Creek above the weir, Condobolin. By the end of October Gladys is probably pregnant with her daughter to be born in July 1910, so the cards over the previous month or two may reflect something of the tensions in her life at that stage. Gladys sent cards to young Will also, and several have survived. An unaddressed card dated 8 November 1909 reads: “Dear Will, [now aged twelve and a half] Just a few lines in the hope of finding you in the best of health. How are you getting on at school? I will send you a real nice p.card next time. This is the only blank one I have. Write soon. Love from Gladys. Tell Molly and Clarrie to write to me. (s.a.g)” Clarrie and Molly were every bit of eight and five years old! Gladys had written twelve months previously, December 1908, “How is your arm?” she asks. “I should not send you a p.c. you did not answer the last one I sent you. Are you having a concert at Christmas. If so, are you in it?” The December date is conjecture based on evidence from the following letters of Mary Hunter to Stella. None of them are dated, but the reference to Mona and Fred’s illness also referred to in a dated letter of Gladys, gives us the clue; and other evidence suggests the dates December 1908 to February 1909. Aunt Mary, William Cant’s next younger sister, seems a lovely lady – all care and a touch of fluster; not quite refined but very good natured. It is said that when she did not have enough washing to make a good impression, she would add sheets and pillows cases from the cupboard to make up a full line. In her letters to Stella, when she refers to her brother William and his wife Sarah Cant, she oddly calls them “Pater” and “Mater” – this unAustralian term seems to be the family custom, probably picked up from their English father, Francis. There are five postcards to her niece Stella in this period and they are very homely: “Miss Stella Cant, c/- Mr. William Cant, Ganger, Yass Junction. Wishing you all a Merry Christmas and Happy New Year with best love from all to all. M. Hunter” for Christmas 1908. In early March Mona and Fred are improving, “The Dr. said they are going as the general run of fever cases. Mona and Fred has [sic] had their hair cut off. We are very sorry to see [it] coming off … How is Willie’s arm getting on?” Her husband, Jack Hunter, visits Sarah and William Cant in Yass at this time. Mary writes: “Tell your mother I cannot thank her enough for her kindness to Jack. Well the children are just as well as can be expected. It is such a lingering illness. They only take boiling water and milk and talk about been [sic] thin. They are something terrible. If you are writing to Uncle Martin [her older brother] tell him about them but don’t say I told you.” Very curious! Abraham Cant was the ninth of the thirteen children of William Cant who married Susanna Curtis; he was a younger brother of Francis (the fifth child) who married his second wife Bridget Horan, the parents of nine children: Sarah Ellen, 22 June 1859; Jeffrey James, 8 July 1861; Francis Patrick, 23 May 1863; Martin, 30 April 1865; William (Lilian Gladys’s father) 14 June 1867; Mary (Mrs. Hunter) 6 October 1870; Bridget, 26 April 1873 – died aged 13, 18 December 1886; Thomas Joseph, 4 June 1875; and Gertrude Matilda, 4 June 1877. Martin, William and Mary we are now familiar with. Abraham Cant married Catherine Martineau and they had thirteen children, including Sarah; they lived originally at Dingo Creek and later moved to Carcoar. We next hear from Gladys in Sydney: there are two postcards dated 4 January 1910, one to Stella and one to her father. Things have moved quickly. There is no indication in the letters of any excitement or special news; she is simply in Sydney, on holiday, seeing the sights, with Mrs Whittaker (a lady of fifty) – and, if we read between the lines, a friend. The friend must be Gladys’s soon-to-be husband, the handsome John James Whittaker. By now they were pregnant with their daughter. To her father she writes, 4 January 1910, c/- Mrs C.W.Brown, “Kerribree”, Hereford St, Glebe Point: “You will be surprised to hear of me being in Sydney. I came down with Mrs Whittaker. She is going home early next week, so I will go home then. Will you be willing for me to bring a friend home with me … They will only stay a few days” – convenient and ambiguous “they”, who had come down from Condobolin on Sunday morning. They went to St Andrew’s on Sunday night – the Anglican Cathedral where John James’s father had been christened in December 1848. The postcard features St Andrew’s Cathedral. On its right hand side are the original gates of the Sydney Town Hall – they now grace the grounds of St Joseph’s College, Hunters Hill. On the Monday night they went “down to the Quay and out to Callan Park”. The Callan Park visit was not out of mere sight-seeing curiosity: they visited John James’s father, John Whittaker. 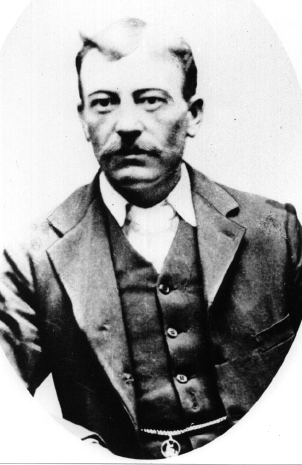 John died in Callan Park Asylum for the Insane, 9 July 1910, at the age of 61. He had been a “general carrier”. The carrier was finally himself carried off by phthisis pulmonalis, a progressive wasting disease of the lungs, probably tuberculosis. His mind must have been badly affected, hence Callan Park. John James was present at the Church of England cemetery at Rookwood three days later to witness his father’s burial. They went to “the moving pictures” and were to go to Manly that day, “not coming home till the last boat.” On Saturday they were to go up to the Hawkesbury Bridge. “So you can see”, she concludes, “we are having a good time”. It was one of the best holidays Gladys ever had. My grandmother was here not for a good time so much as spending her time looking after others. There were occasional short trips and a holiday with Honor in Tasmania around 1950, but life was hard for Gladys and she bore it gladly – like her name. 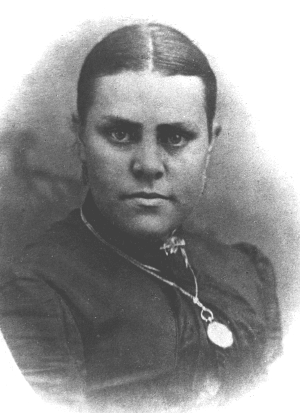 The friendship with John James included more than sight-seeing: Gladys at this stage was some two months pregnant. No doubt it was at this time that John James bought her the exquisite engagement ring: it is utterly simple with three sapphires and two diamonds set into a plain arched band of gold incised with several simple scrolls. My mother gave it to me in 1974 and I wear the ring now. 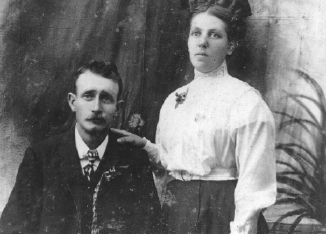 Gladys and John James Whittaker were married 16th February 1910 at St. Augustine’s Church, Yass, her family’s home place: he was thirty one and a handsome man, she was twenty and winsome. The wedding must have been a family affair because William Cant had given his consent, Stella was a witness if not a bridesmaid, and the wedding photo is a work of art. A hand painted photograph cut out and pasted between sheets of glass, with a painted background to give a three dimensional effect – all in an oval frame. The wedding dress was elegant, high-necked and embroidered, and John looked splendid in a dark suit and patterned waistcoat: it was no slap-dash affair. The marriage certificate indicates that the marriage took place 16 February 1910 between John James Whittaker, bachelor, aged 31, farmer of Condobolin, born Cowra NSW, his parents John Whittaker (by now in Callan Park) and Elizabeth Stephens, and Lilian Gladys Cant, residing with her parents, Yass Junction, spinster, aged 20, born Goulburn, her parents William Cant and Anne Wessler [deceased]. They were married at St Augustine’s Church Yass. There is no indication that John James was a Catholic, though the officiating Minister was (presumably Father) John Leonard. There was no consent given by parents for John James; however, William Cant gave his consent for the marriage of his daughter. The witnesses were Patrick Shiels and Stella Cant. There was no address, to or from, on the card. The most intriguing thing is that the writing is back to front: hold it up to a mirror and the writing is perfectly legible. It was an art Gladys had cultivated: there is a small example of it in the Composition Book. But why all this seeming secrecy? Gladys’s marriage was not a complete surprise to the family; there was a month’s warning; the events surrounding the wedding seem normal enough. Did the early pregnancy worry them? It may have been an embarrassment for Sarah Cant, though William Cant and Anne Wessler’s marriage was just in the nick of time: two days between their marriage and Gladys’s birth. Maybe Stella was out of favour over the birth of Jack Cant out of wedlock; but yet she was a witness to Gladys’s wedding. Whatever the cause, the back to front writing is fascinating – and very skilful. And the cause may well have been both those matters: Jacqueline was to tell me 11 November 1986, after this story had been originally written (1986) that her mother, Stella, was indeed out of favour: she had to seek refuge in the later stages of her pregnancy or perhaps after Jack Cant’s birth, 16 December, 1909, at the Salvation Army Home at Marrickville. Sarah Cant may have been mortified by the untoward pregnancies of her two step-daughters. One might imagine a to-do, especially if Sarah’s husband himself had married a part-Aboriginal girl and taken her to the altar a mere two days before she gave birth to their child! This can only be speculation and may be far from the truth. It may be too easy to paint Sarah in a poor light, for she cannot speak for herself; and it is to her eternal credit that she was prepared to rear the children in the faith of their father. Gladys’s postcard of 21 June 1910 is the last one for six years, and things seem to have returned to normal. Stella is again at Yass Junction, (I have no idea who was looking after baby Jack Cant). “Jack and I are in good health at the moment” [though she is a month away from her confinement]. The weather is beautiful; Yass is very cold – though the winter has not been a cold one; any news of the Cants in Cooma? Condobolin show will be held in August this year. “Jack is going to write every day, but he keeps putting it off” – and Gladys is getting to know the man she married! The card features two kittens and the inscription: In Kindness and Sincerity, for Friendship and for Memory. Greeting! Whatever storm seems to have marked the previous card, all seems to be back to normal. Life must have been hard for Gladys, but she was tough and certainly not afraid of hard work. I suspect that she had to work to make ends meet: John James had no trade or profession, having worked with teams of horses at an early age and being involved with timber getting. In one of her letters she refers to him “ploughing his crop” (26 April 1910) and on Honor’s birth certificate he is described as a carrier. I know from Doug that at some time the family was living in a tent in the bush and there was trouble with biting camels and mischievous horses. Gladys told a story of leeches attaching to her leg and out of fright she sliced them off with a sharp sickle, which left its mark for the rest of her life. Doug used to delight in saying he was born in Cowra “at the foot of Billygoat Hill”, (which I discovered was where the hospital was situated!). 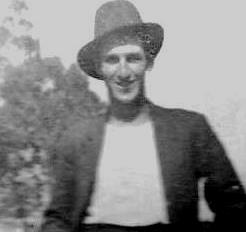 But whatever the sequence of events, the family were back in Condobolin in 1916. No doubt there were other cards, but her next extant letter of 11 November 1916 is written from Orange Lane, Condobolin. Its glancing reference to World War One is touching, and the letter also shows her devotion to Stella: “I am writing once more to let you know I got the parcel safely yesterday evening. What a long time it took to come. I will try to have your skirt done and sent back by Tuesday. I was surprised when I saw the length of the tear. I imagined it to be something like the others but I will fix it up for you. Send along anything you want done. I will gladly do it for you. I must thank you for the nighty [sic] and the camisole. They are very nice and won’t take me very long to work them. I must try to have them done before Xmas if possible. The fur is very nice now and so are the photos. They are very like you. Mrs Mc [possibly Mrs McNulty] says the one of the bust is just what you looked like the day you were dancing around with ‘Bimbi’. [This is probably a nickname for John Sivyer whom Stella was to marry in 1919 – he was born in Bimbi.] I have a terribly bad headache today. I can scarcely see to write. Did you get two letters this week? I sent a short one on Tuesday and a long one on Thursday. I have to scrub the kitchen and back veranda now, then go to the train with this. I have to go to my lesson at 2.30 today. [What lesson? Was it the piano? She was denied the chance to continue with the instrument some years before.] I went yesterday but they were entertaining someone at afternoon tea. Twenty boys are going away today. I will be able to see them off, won’t I. No more. Love from Gladys. A fascinating card! What kind of lesson was it? Whose place was she scrubbing? She would have known a number of the boys going off to the First World War. Where are Jack and the children? And how anxious she is to do that sewing for Stella. Gladys’s needle work was beautiful and she tried to pass on her skills. The card features a girl sitting on a man’s knee. It says: “I am holding my own in Parkes.” The girl’s hand has “Stella” written on it, while “Gordon” is written on the man’s hand. This is not in Gladys’s handwriting – Stella may have written it in later. 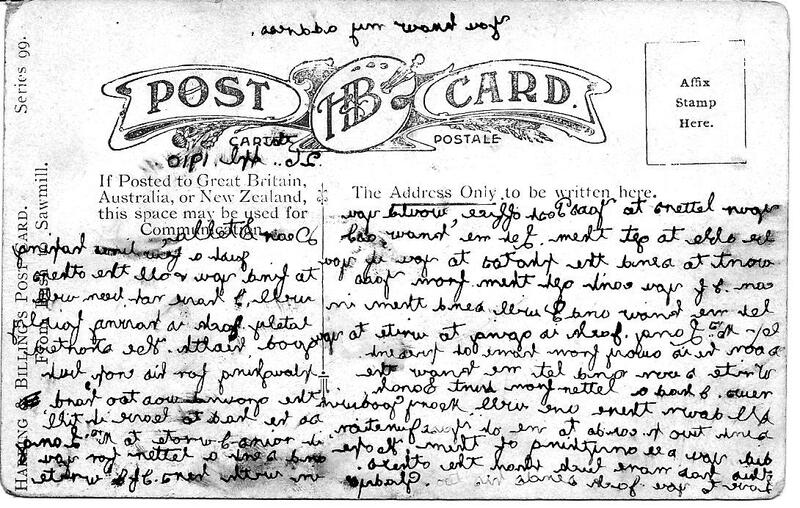 Another undated letter (my guess is 1919) to “my darling” Stella from Condobolin refers to the dust storms every day. She asks after Jack – either Jack Sivyer whom Stella was to marry 24 May 1919, or young Jack Cant, now aged about 10 – “How is Jack? He must be very lonely.” Gladys feels the heat – “It was frightfully hot … I thought I would peg out [now, that is a Gladys phrase!] We have had an awful dust storm every day. Picture how it disheartens you when you clean up. PS: Give my love to the girls and tell them to write [whoever they were].” This card speaks volumes about Gladys’s bountiful affection and willingness to do whatever hard work came her way – that was the Gladys I knew from the 1940s till she went into a home for the aged in the early 1970s. I recall a similar dust storm in Condobolin when I was younger than five, let’s say 1943 or thereabouts; the adults said “We’ve got to rush home, there is a dust storm coming.” I have recollections of them stuffing newspaper at the bottom of the doors. Another card is addressed Orange Lane, Condobolin, but no date though I guess 1920. She keeps working for her sister: “… I sent you your coat today. I do not know whether it will suit you or not. I could not do any better because there was not enough material. I think that had Mrs. Smith [Gladys’s mother-in-law, the former Mrs. Whittaker, who married William Smith in 1919] not joined the pieces I could not possibly have got it at all. I had it done by Thursday but your boy did not call for it. I don’t know what I did to him. He calls every other time. I stayed up till one o’clock on Wednesday night so that it would be done. I hope you like it”. It is addressed, as is the last card, “My darling sister”. She ran a boarding house called Myra Cottage – in Denison Street, I think – in Condobolin for some years, and it was to become a bone of contention: John James was inclined to jealousy. 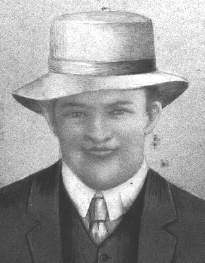 Stella was now married to Jack Sivyer, reputedly a fastidious man who was bound to have everything “in apple pie order”. The holiday at Katoomba is beautifully captured in a photo of Stella and some friends below a waterfall. The reference to “Jack ‘The Greek’ ” is intriguing, but obscure, and uncharacteristic of Gladys. 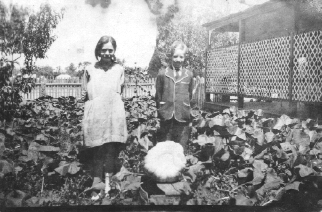 The Cant family had moved to Sydney by 1914 to provide opportunities for the younger children. The next Easter Gladys’s favourite brother, Frank, died; but there are no extant letters with any reference to the death. I wonder whether she travelled to Sydney for the funeral. It has a cute image of two young ladies stepping across a stream, skirts hoisted, showing their ankles, with the phrasing: “We’re Picking up alot [sic] in the Town, and having a most El-leg-ant time.” Everything points to John James, and my sister says the writing is his. On that happy note we leave Condobolin. It was 1926. Gladys had been running a boarding house for eight or nine years. The children were growing up. Gladys was thirty seven, Jack forty six, and he looks every bit of it from a photograph taken about that time of a group of boarders on the front steps of Myra Cottage: he is there with Gladys and Honor. The youthful good looks have faded; the prospects of employment for the children were unpromising; Jack was jealous of Gladys with the boarders, and he was probably not all that close to the family, the romance of 1909 having long since passed. 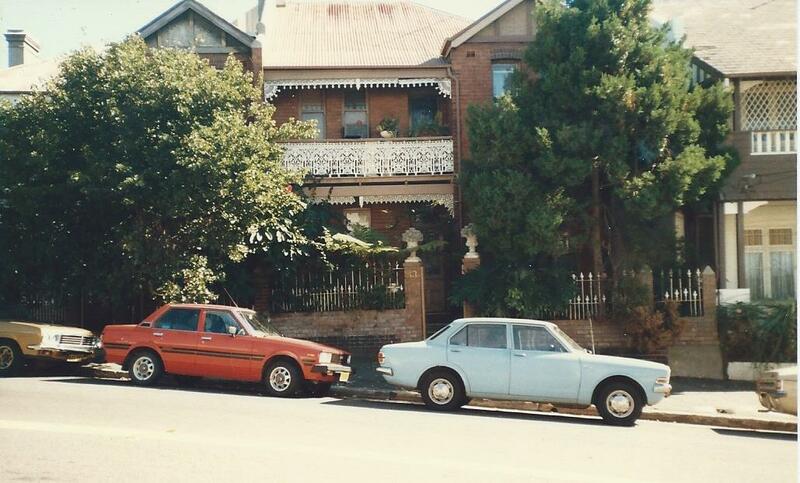 Gladys was the centre that held the family together and she decided it was time to move to Sydney. The decision having being made and everything packed, Jack could not make up his mind. Gladys and the children went; Jack and most, but not all, of the goods followed. How much of what was valued and treasured has been lost in the many moves that the family has made. In more recent years it was to be expensive cut glass and bedroom suites hand-made and French polished by Malcolm George and friends, Japanese dolls and a Japanese ceremonial sword, among many other valuables. The Sydney sojourn begins at 28 Gosbell Street, Paddington: J. Whittaker is listed at that address in the 1927 Sands Directory. Honor goes to Business College and Douglas to the Christian Brothers School next to Sacred Heart Church, Darlinghurst, and their story is told in another chapter. Gladys must have taken on many jobs, mainly cleaning, but I am unaware of the nature of these during the 1930s. 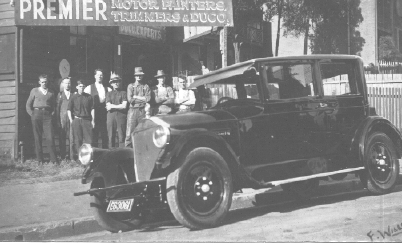 Soon after Jack arrived he became involved in a garage business in Boundary Street, Paddington, between Campbell and Coombe Streets. It was not a success by all accounts, and was eventually to be burnt out. He was to take up work with a vacuum cleaner in time and saw out his working days in the homes of various folk around Paddington, setting off in the mornings with his cleaner strapped to his back. Gladys was a good business woman and invested in properties. 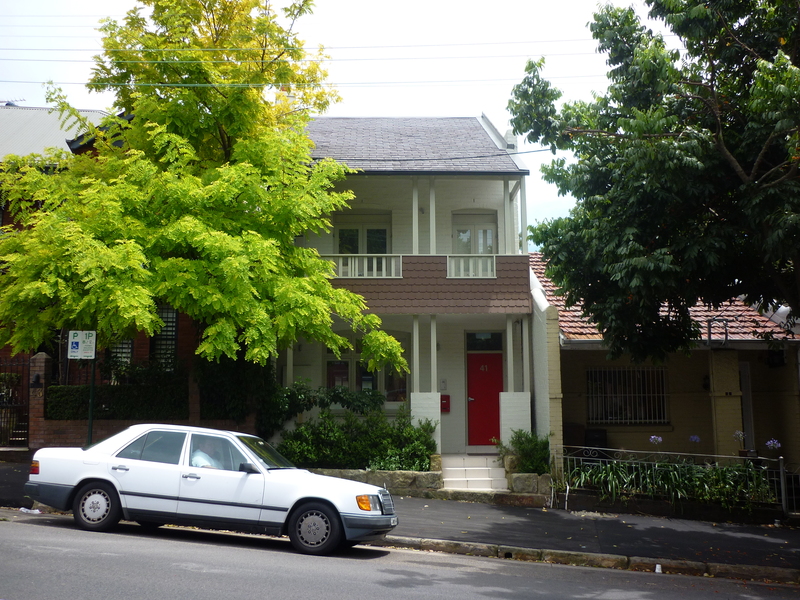 She owned the Boundary Street house and she had properties at Manly Vale and in the Blue Mountains. She made no money, to speak of, from them. She was a hard working woman for whom hard work was second nature. When I became aware of her in the 1940s as a youngster I was awed by the amount of work she did. The following information comes from the archives of the Sydney Town Hall, courtesy Graeme Shirley December 2016. *I presume this is my mother Honor Butler but I do not know what lies behind this note. From this chart it appears that John (and Gladys and children) lived at 43 Boundary Street Darlinghurst (with the lovely name Camira) from 1933 till moving into 41 Boundary Street where they were living in 1939. By 1945 Mrs Lillian G Whittaker is living at and owns (I believe) 41 Boundary Street. 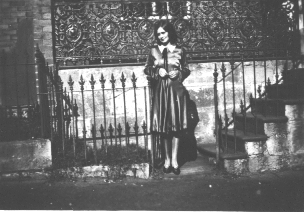 In early 1947 Honor moved into her mother’s 41 Boundary Street house with two of the children, Tony and Adele, while her husband Malcolm George Butler was in Japan with the British Commonwealth Occupation Forces, and the oldest child Paul was boarding at St John the Baptist Boarding School at Hunters Hill. Gladys moved into 43 Boundary Street probably in late 1948. Meanwhile Jack stayed in the front room at 41 while the rest of the bottom floor was occupied by the Butler family (Paul still at Hunters Hill) and a family named Hamilton lived upstairs. It is hard to imagine many families living that way these days, though there must be plenty of such families around the country. Mrs Ethel Maud Mary West, presumably the widow of Edward West, lived in a house in 160 Barcom Avenue, immediately behind the 41 Boundary Street House, between the Alfanos and the Whartons. My recollection is that she kept very much to herself and we children thought of her as a recluse. Many years later, probably in about 1960, my sister Adele nursed her in St Vincent’s Hospital and found her a gentle old woman, grateful for the attention. Gladys began working at Bathurst House in Castlereagh Street, next to the Fire Station, in 1929, according to a reference dated 15 June 1933, from Ernest Steele, the long-time caretaker and friend. He says that “Mrs. Whittaker was employed by me at the [Bathurst House] address for the last four years.” She is “straightforward, honest and a very good worker … who holds the respect of myself and every tenant in the building”. Gladys must have been applying for some new job, maybe at the ANZ, for there are several references written in the month of June 1933 from, besides Ernest Steele, F.W. Marlin of the Condobolin Steam Saw and Planing Mills (he gives her address as 43 Boundary Street), Thos. B. Watson, Universal Providers, Condobolin, from B.J. 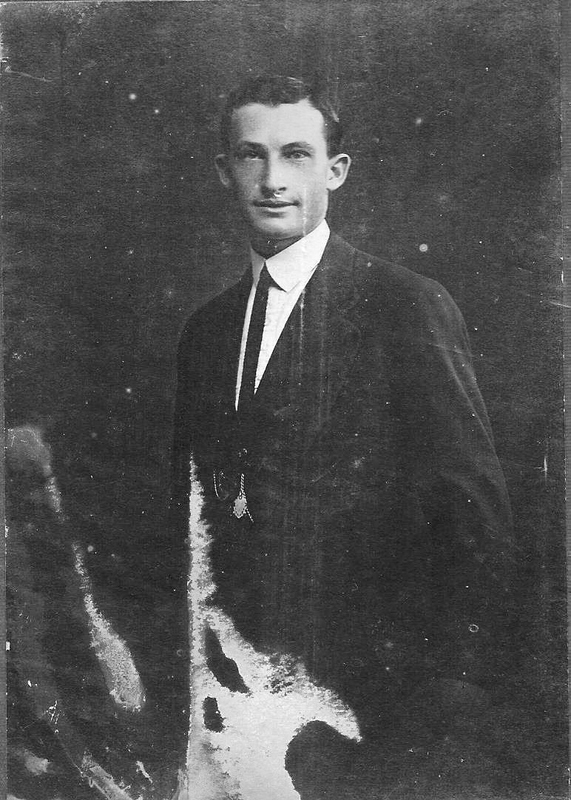 Dunphy the Shire Clerk of the Lachlan Shire Council, and from Hon. H. C. Moulder M.L.C. They all attest to her good character, “very honest and trustworthy, a fine citizen of Condobolin whom we could ill afford to lose (and her family were like her goodself), a woman of splendid character, a good Mother bringing up her two children in the manner that reflects the greatest credit on her, respected citizen of the town, capable, energetic, highly recommended”. They certainly reflected the woman we came to love as our grandmother. These are further written tributes to the “valiant woman”. She was up at four or five o’clock in the morning and would go to the city, often enough on foot, and work at cleaning during the day. She would clean and polish the ANZ Bank in Bathurst Street, between Castlereagh and Pitt Streets (later moved to the north-western corner of Castlereagh and Bathurst Streets) and be finished before the bank opened. Then she was off to Bathurst House, where she cleaned a number of showrooms in that building. She worked for such names as Pankhurst who sold buttons, for Paynes who sold glassware and crockery – she found her niece Yvonne her first job there – and McGillvrays who sold Rondon shoes, and whose son Allan became the cricket commentator. Those floors and corridors were spotless and she did them by hand: she could never manage the electric polisher which got away on her, so she went up and down with a padded broom weighted with lead. The employers treated her with respect and affection and a touch of reverence. On a number of days a week when she had finished at Bathurst House it was off to the Pickwick Club in Pitt Street near Hunter Street where she was employed to make hors d’oeuvres – savouries we used to call them. None of your Jatz crackers and French Onion dip: this woman started from scratch. Fancy shapes of bread cut out by hand, deep fried and drained, special toppings made – cream cheese (at home it was made several days before a function and hung up in muslin to drip, in the lean-to which was the laundry), gherkins, anchovies, coloured pickled onions, sliced and curried boiled egg, and the inevitable paprika. She worked for hours on these concoctions. And there must have been cleaning involved because she sometimes arrived home at midnight, having to face another rising at four. On a bad night she would also be faced at that late hour with Jack, “dying” yet again, who had to be taken to Dr Waddy in Darlinghurst Road or to St. Vincent’s Hospital. Jack was always dying. Her hours seemed long, and while there is always danger of romanticising those we admire, she certainly did rise at that early hour, and on many nights she arrived home very late. This went on during the Forties and Fifties and into the early Sixties. Even when the family moved to Elanora Heights in 1957 she walked the three miles from home to Narrabeen to catch the six o’clock bus into the city to continue her cleaning jobs. She was seventy. She retired from the ANZ Bank early in 1960. A letter from the manager, 16 March 1960, says “we will all miss your cheerful good morning as we come to the day’s toil. I would like you to know how I personally appreciate the way you looked after and kept the premises and especially the way you always had my room spick and span and ready for me. The Chief Manager also desires me to convey to you the Bank’s appreciation for your long and faithful service”. She received £141/10/11 for Long Service Leave and pay in lieu of holiday leave: the 11 pence mattered in those days. I was eleven and much as I loved her, I believed her. I once hid in the toilet from her and was so afraid she would bash the door in that I meekly gave myself up. She would never have laid a hand on me – the words were admonition enough. This same fearsome woman also bought me a picture of the Sacred Heart to hold pride of place in the kitchen, with an oil lamp and a supply of mineral oil to burn before it, much to my father’s amazement and the accompaniment of smoking wicks. She may have seen something in me at that time that I did not realise. She was the valiant Woman of Proverbs: she sought out linens and worked them, she made waistcoats and dolls’ bedspreads; she brought food from afar and cooked it magnificently; she rose in the night and attended the household – her husband, or on one occasion rushing me to St Vincent’s when Id cut my finger badly while preparing supper for the Misses McNulty, Biddy (I once said Bridget and was roundly reprimanded!) and Anne. She laid her hand to the spindle and the distaff, and sometimes to our bottoms metaphorically speaking; all her household was well clothed in good garments; her husband was known in the gates when he sat with the elders of the land, and she did not quite approve. Strength and honour were her clothing, she opened her mouth with wisdom and on her tongue was the law of kindness. Her employers and those who knew her as a friend had tremendous respect for her, because she was an honest woman for whom the job was a sacred task. Socially speaking we were ordinary middle class in those days, but Gladys could hold up her head in any company. On one occasion she held a party at Boundary Street for the Pankhursts who were wealthy enough to have an apartment at Gowry Gate in Macleay Street, Potts Point. It was a pre-Christmas function and Gladys prepared everything for it, with our help, of course, though we children were not permitted at the table. I remember bringing in the champagne in an old aluminium bucket – they had the grace to laugh and I got away with it, even after the guests had departed! Her brothers and sisters and nieces seemed to look to her, for support: she seemed to be the centre of the family. She could wring out sheets for Jacqueline if her wrists were too weak to manage, she would encourage Clarry to have a twenty-first birthday for his daughter; she would make cups of tea for Jack Cant when he arrived somewhat the worse for drink. Her own daughter felt she took second place to these people when their needs seemed greater. That was Gladys – if others needed it, she gave, and we gave too, not because she did not care for us, but because that was simply the right thing to do. Of course this may have left some feeling neglected or overlooked, but in the long run we were better people for it. We missed out on nothing. When I went to Bowral and Mittagong to join the Marist Brothers, the family, having been to early Mass at Sacred Heart, would arrive six or seven times a year by train or bus, laden with food and cakes and gifts, and spend the day with this youngster who wanted to be a Brother. Gladys was always there with the support of her love and prayer and cooking. She was a holy woman, not in any showy way but with a quiet, humble, almost Jansenistic piety. She was a devoted Catholic and brought up her children to be the same, while her husband could not be said to be a religious man. Sunday Mass was a happy obligation which she would neglect at the peril of her soul, yet she never went to Holy Communion – some Jansenistic streak in her which would not allow her to approach the Blessed Sacrament until very late in her life. You would not dare to ask a question like that. She was always devoted to the novena to our Lady on Saturday nights: we all went, whether we liked it or not, though sometimes our father would put his foot down and say we weren’t to go – but he would change his mind and we would rush out, probably just for relief from the tension in the house. In the early Fifties, Gladys and Honor bought two pieces of land at Elanora Heights. We had been living in 41 and 43 Boundary Street, Gladys having moved back into 43 when our family moved into 41 in 1947: there was news that a freeway would go through the property so we sold and moved to Elanora Heights. The Kings, the Golds and the Restuccias stayed, even till quite recently; the houses are still there, the freeway still to come. The new house at 33 Coolena Road was one I never liked: single storey, stained weather-board, and open spaces inside. I felt ill-at-ease in it. I was there only during occasional holidays, but the family was there from 1957 to 1967. Gladys, again, held the family together: our father never moved, and he died three years later in Darlinghurst; Jack Whittaker pottered around, gave up his pipe and tried all manner of things to ward off the intruding breezes till he died in 1964; Paul moved away to sea; Adele went to Adelaide to study midwifery in January 1965; Honor was ever faithful and in the background: who knows how important her support was to Gladys’s centrality. 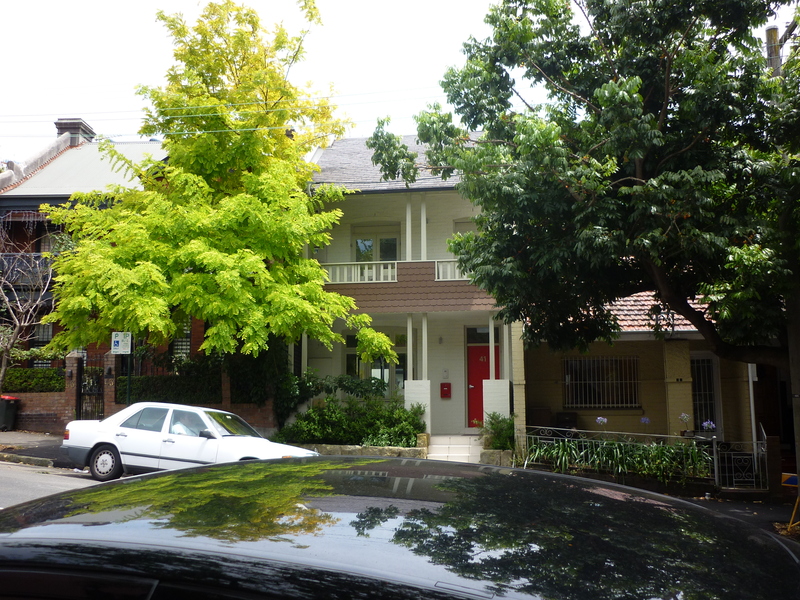 In 1967, after managing for a few years on their own, Gladys and Honor called it quits at Elanora Heights and bought a unit in Neutral Bay: Unit 8, Gladstone Court, 10 Lindsay Street. It was one of the nicer kind of units put up in an age of average quality. 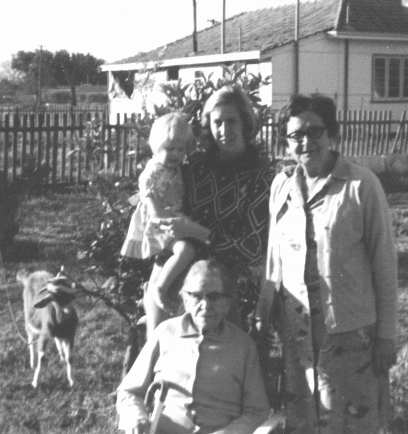 At Easter in 1972 Gladys, Honor and I took a nostalgic trip to Condobolin. As we travelled through Parkes we were able to meet her old friend Mrs Glad […] at the station, a lady Nan talked about with affection. (I cannot remember the surname.) We stayed in a motel, walked the town, visited Aunty Mag, the pisé house (occupied by Bill Oppy, son of Jack Whittaker’s sister Doll) and the cemetery, as well as spending time with Ted and Doll Oppy. It was wonderful time for us. Ted wrote to Gladys, 3 May 1972, to express his hopes that she had recovered from a fall she had in the Condobolin Motel while we were there. In 1974 Gladys began to deteriorate. She had been a strong woman and a powerful personality, and did not give way to the flesh. The flesh itself began to give way: she had always suffered from headaches; she had a hernia operation in 1963; in 1964 she lost the sight of one eye because of a detached retina. In 1974 she broke her hip and that was the beginning of the end: some time later in the Mater Misericordiae Hospital at Crow’s Nest, the onset of senility; into a Nursing Home at Cremorne; then a few years in the Loreto Nursing Home at Strathfield. Honor visited her regularly and seemed to communicate with her; I could get no response. On Adele’s visit from Perth, after an hour of conversational chatter she said “I’ve got four children. I’ve been a busy girl, haven’t I!” and Gladys responded “You certainly have.” That is the last thing I know she said. They were fitting words for Gladys. She was not afraid of hard work – she enjoyed being busy and approved of others being busy: the notion of four children to be reared and educated and cultivated would have appealed to her. And she was always wonderful in support. It is no wonder that Adele’s statement elicited the approving words of this woman: “You certainly have”. 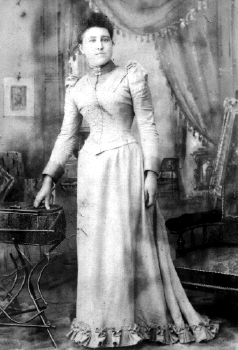 Gladys was a peacemaker and did much to heal the rifts in family relationships: she could keep in touch with Uncle Bill when his marriage may not have been popular; she could support and encourage Stella’s children, the outsider Jack and the fondly-regarded Jacqueline; she could push Clarry into doing something for Von; she made contact with Molly after a rift of many years; and she wished at the last to be buried with her beloved Frank. Von and Jacqueline still glow when they talk of “Aunty Glad” – nobody else in the family elicits such a response. So the valiant woman went peacefully after lunch one day, 20 July 1979, “in my ninetieth year” she would have said. She was buried from the Sacred Heart Church, Darlinghurst, where she had faithfully worshipped for so many years, her lamp finally gone out in the night. She had opened her mouth to wisdom; the law of clemency was on her tongue. She had looked well to the paths of her house and had not eaten her bread idle. Her children rose up and called her blessed and in his own way her husband praised her. Many women have gathered together riches, but she surpassed them all: may she have the fruit of her hands, and may her works praise her in the gates.